making: ROBYN'S FETISH CHALLENGE #256 "ADD A BOW"
ROBYN'S FETISH CHALLENGE #257 "EASTER CARDS"
ROBYN'S FETISH CHALLENGE #256 "ADD A BOW"
ROBYN'S FETISH CHALLENGE #255 "PURPLE AND GREEN"
ROBYN'S FETISH CHALLENGE #254 "PEARLS OR GEMS"
ROBYN'S FETISH CHALLENGE #253 "USE A DIGI"
Good Morning. Welcome to the first weekend of Spring. I know a lot of people are real excited for this season to arrive. I will just miss the snow. I do have some exciting news from the home front. My daughter went to get her temps yesterday and she passed. She is bouncing off the walls and wants to know when we are going to start teaching her to drive. We didn't do it yesterday because this week has been very hectic and we are taking the weekend off from going anywhere. I feel so old now that my last child is getting her license. Then there will be the dating and off to college before we know it. I have had kids my whole life since I graduated high school and don't know what I will do without them. I'm sure I will figure it out when the time comes. Well this week we have a great challenge and it's easy to do. Just add a bow to your project. You can find many things to add a bow to. I was lucky and found a beautiful ribbon to make a bow from that matched my card perfectly. The image that I used this week is from Fresh Brewed Designs. You should see the cute images that she has for Easter. You will want to win this challenge and get one of those Easter images. The image that I used from their store is called "Banana's Over You." It's two monkeys sitting at a table drinking out of the same milkshake. This image reminds my of those old ice cream shoppes. Before I show you my card I want to tell you what Fresh Brewed Designs is giving to one lucky winner. Great Prize if you ask me. Banana's Over You is my image and here is my card to show you what it looks like. See if you think it looks like one of those ice cream shoppes. This is such a cute image and the paper that I found to make the card worked perfectly. I tried to make the straws look like the older ones but couldn't get it to work so they are just plain red. Here are the items that I used to make this card. Wow. Looks like there is more there then what I used. I wanted to make sure you knew where everything came from. I enjoyed making this one and coloring the image. Well lets see what you can do. Just enter over at Robyn's Fetish Challenge Blog and when you are there look at the other design teams creations. Let them know what you think of them. I will see you in a week and I hope it's a great one for you. 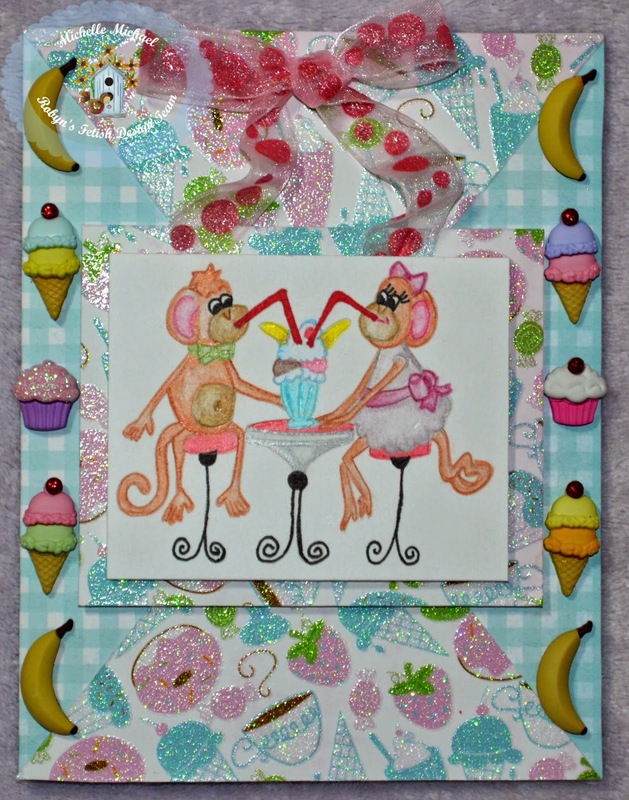 Great fun card, love the added elements and the colours are great.